How the U.S. (and the world) can best react to China’s new activist foreign policy moves. Since November’s APEC meeting, the entire global society has been discussing China’s new world role and changing diplomacy. For a long time in its past history, even though China has always been a large power due to its size and population, it has never been a power with global influence or served as a global leader. In fact, only after China’s reform and opening up in the late 1970s, and especially after China joined the WTO in 2002, has China become a full member of the global society. As Henry Kissinger once said, the Hu Jintao-Wen Jiabao administration (2002-2012) was actually the first Chinese leadership in the long history of the nation who governed China as a full and equal member of the international society. In the past two years since Xi Jinping came to power in 2012, China’s diplomacy has undergone a major transformation in regards to its role in the world. China’s shift from a participant to a leadership role was clearly on display at the APEC meetings. A vital question for the rest of the world is how to understand and respond to China’s transformation into its new global role. For this I have three suggestions – patience, positive interaction, and constructive cooperation. Even though the Chinese have made some major proposals and initiatives in recent months, most of them are still in the stage of planning rather than action. For example, Beijing used the APEC summit to present its proposals for regional integration, including creating an Asia-Pacific Free Trade Area and displaying the new Asian Infrastructure Investment Bank (AIIB). Some onlookers who have taken notice are already calling China’s new proposals a Chinese version of the Marshall Plan. Some China watchers have interpreted these new initiatives as China’s plan for an ensuing struggle for power and influence in Asia with the United States. However, it is still too early to pass judgment and come to this conclusion. It is also important that in such a globalized world we avoid seeing everything from a zero sum perspective. Making evaluations too soon could further strengthen existing misconceptions and stereotypes, which can prove very difficult to change later on. Beijing is still in the early stages of policy planning, and even for the Chinese government some of these ideas are very rough and unresolved. China’s regional integration road-map is a policy that cannot be fully evaluated at this time, and as it stands a wait-and-see approach is needed. The international society should welcome a rising China that willingly takes on more global responsibility and leadership. In fact, in recent decades one of the main criticisms of Chinese diplomacy has been the lack of Chinese active participation in global affairs, with Beijing not taking on its due responsibility. For example, President Obama not long ago criticized Beijing by labeling China as a “free rider” and a state that takes advantage of the United State’s global leadership role. From this perspective it is a positive that China’s new administration is willing to contribute to global affairs. This has been seen recently with Chinese Premier Li Keqiang having announced that China will offer more than $3 billion in aid to neighbors Cambodia, Vietnam, Myanmar, Thailand and Laos to improve infrastructure and production, and to fight poverty. Beijing’s help with public goods and development with its Asian neighbors and the AIIB is a positive undertaking for these countries, and a new action from their giant fellow Asian nation. Rather than debating Beijing’s ulterior motives, it should be seen as a great improvement that China is reaching out to help its neighbors. In a response to Obama’s free rider comments, President Xi has openly talked about China welcoming its neighbors to be free riders on China’s development. This is a positive attitude from China, and one that needs to be encouraged. Beijing is currently at a turning point of making some important strategic positions and policy adjustments. Historic retrospection on China’s last half century often reveals that external factors, especially the United States, have had a huge impact on China’s policy making. Historical experiences have also shown that certain kinds of pressure from the outside can be self-defeating and slow down or even halt a country’s progress, especially when undecided policies are interpreted as strong and aggressive. Even worse, external pressure all too often is exploited by politicians to cement internal solidarity, undermine political opposition, and mobilize popular support. So instead of passing judgment on China’s new change in policy, Washington should take a more constructive approach. Continuing communication and dialogue with Beijing are very important during this period. This is also in the interest of the United States. With China’s rise, the U.S. and China should become more and more the “group of two,” working partners who share in global leadership. Working together and trying to shape and influence China’s foreign policy rather than taking a hardline, defensive and hostile attitude toward China’s change befits the U.S. Washington should take a constructive approach with the new Beijing, not a hardline realist stance that assumes China has a master plan already set in the background and there is some unavoidable conflict ahead for the two states, a perception that has become all too customary in Washington’s cross-Pacific dealings. Instead, both governments should “show their hands” and lay out their goals and intentions. This is the best means of avoiding a power struggle and giving the policy creation process time to work itself out. The world is so highly interdependent that to jump to a hardline “realist” assumption could be not only wrong but dangerous. 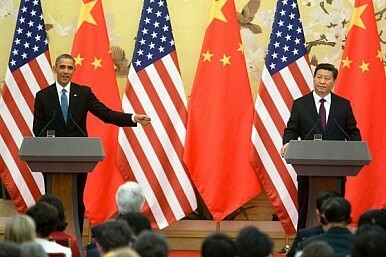 Is There Room for the US in China’s 'Asia-Pacific Dream'? China's "Asia-Pacific Dream" involves a region led by Beijing, not Washington. China's Foreign Policy in 2014: A Year of 'Big Strokes'The Beijing APEC Summit in ReviewUS Pressures China to Kill Asia-Pacific Free Trade Agreement TalksDespite Its Global Expansion, China Stresses No Intention to Displace USWhy Is Yang Jiechi Visiting the US Now?